However, it is not just the number of MPS that is important, winning in Beirut is highly symbolic and is almost a requirement for a President, or after the war for the Prime Minister. Indeed, because of its symbolic status, Beirut districts have always been gerrymandered, to shore up or strike down a leader. For example, in 1957 elections ** President Chamoun added the largely Christin neighborhood of Achrafieh to a Muslim one. At the time, Christian outnumbered the Muslim, which insured the loss of all the Muslim leaders who oppsed Chaoun (like Saeb Salam and Abdallah Yafi). This is was one of the reasons of the 1958 civil war. Additionally, in 2000, the Syrian pro-consul in Lebanon Ghazi Kannan, specifically redistricted Beirut to ensure the defeat of Prime Minister Hariri. Fortunately, Rafik Hariri’s popular support was such, that it propelled him to win a clean slate of all the capital MPs despite the gerrymandering. Even in the latest electoral law, Beirut redistricting was the subject of many heated debate and negotiations. Consequently, in the current law the capital was divided into two big districts: Beirut I, 8 seats with a clear Christian majority, and Beirut II, 11 seats, with a clear Sunni majority and a significant Shiite minority. In 2009, Beirut was divided into three districts; I and III were similar to today’s districts, with Beirut II being a small district with only 4 seats. It was split and the seats divided among the two others. In that last elections, PM Saad Hariri handily won Beirut III, the district with a Sunni majority, and took all its seats (with around 78,000 out of 110,000 votes , in a majoritarian law). Beirut II was not fought over, and the seats were divided between the two opposed coalitions (March 8 and March 14). Beirut I district was fiercely fought over, and along with Zahleh, was the district that gave March 14 its 71 to 57 majority in parliament. March 14 won the five seats of Beirut I with a slim majority, defeating current President’s Aoun FPM. 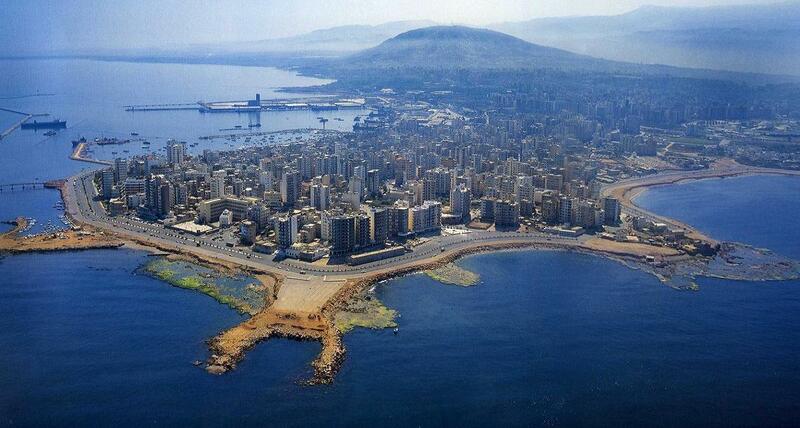 Today, Beirut II is one of the most competitive districts, with the most number of candidates and lists (a total of 9!! ), and a relatively low projected threshold of 12,000 to 13,000. PM Saad Hariri, still enjoys a large and strong following in the Sunni community. However, the new proportional law would make it impossible for the Prime minister to win a clean slate, like in 2009. PM Hariri and Future Movement number of seats in Beirut II will be directly linked to the participation levels of the Sunni, and how big of a majority PM Hariri still musters among them. In short, PM Hariri needs to raise the participation in Beirut II from 2009 38% to at least 50%, while still getting +60% support in the Sunni street, to win a significant portions of the seats (around 7 or more). A total of 9 lists, are competing. PM Hariri’s Future Movement list “Moustaqbal for Beirut” is starting with strong base, with at least 5 seats, and a possibility for more, depending on the participation levels. However, they are strongly challenged by a coalition of Hezbollah, Speaker Berri’s and FPM. This second list. Called “Wihdat Beirut”, enjoys a solid Shiite base of around 40,000 voters, and the backing of Al Ahbach organized and reliable voter bloc. They are starting with at least two to three seats, with a big possibility of winning more, depending on the participation level of the Shiite bloc. Next come two lists who have a strong chance of netting a seat each or maybe more. The first is a list, called “Beirut el Watan”, supported by old allies of PM Hariri like Salah Salam who have taken a stronger stance against Hezbollah, and are allied to the Jamma Islamieh (an offshoot of the Muslim Brotherhood.) The second is the list called “Loubnan Harzan”, headed by Makhzoumi, a wealthy businessmen, who has been spending his money in Beirut for charity and politics. Makhzoumi’s chances are a bit less than the Salah’s list, but they look like it will win a seat. .
Next comes several civil society lists. In 2016 municipal elections, Beirut Madinaty came within a stone throw of winning, against an alliance of all political parties currently in power. One of the reasons they failed was the presence of a second civil society list, headed by an ex minister Charbel Nahass, who got exactly the difference between Beirut Madinaty and the mega parties coalition. Unfortunately, in these elections civil society did not learn their lessons, and were split among several lists. With this law, dividing ones base of support is the worst decision that can be made. It ensures the failures of all these lists, helping the entrenched parties get even more seats. The list “al mouaarada el Beirutiah” allied with General Rifi has the most chances of getting through, among the civil society lists. The district with a Christian majority (for an analysis of the Beirut II district and the general background check here) . There are currently 134,000 registered voters. In 2009 only 32% voted, but this is expected to be higher. Nevertheless, with only 8 seats this districts will have the lowest threshold in Lebanon, ranging from 6,000 to 7,000 . There are two main lists running: The first “Beirut al Oula” formed by a coalition of Kateab, LF, the Ramgafar Armenian Party, and Michel Faroun, a prominent political figure in Beirut I, who already won in 2009, and has a large network of voters and notaries that owe him their allegiance. This list is formed by a strong coalition and has several significant voters bloc. The list has a big chance of winning at least two to three seats. Next comes the second strong list, “Beirut el Oula al Kawiah”, formed by a coalition of FPM, Tashnak, and Future Movement. This list, minus FM, is similar to the one that ran and lost against March 14 in 2009. FM switched their votes to the FPM, bringing a significant Sunni bloc of at least 6,000 voters. They have the upper hand, especially with several heavyweights like former Minister Sahnwai who is very popular in the area, and the famous Tashnak organized and precise voting bloc. The list would probably approaches 4 seats. We are left with three more civil society lists. Once more, they committed the same cardinal sin, civil society did in Beirut II district and all over Lebanon. They split their voters’ base among three different lists, of which some have more chance, especially with the low threshold. Michelle Tueni’s “nehna Beirut” and “Koulouna Watani” have some chances of winning one or two seats. It is important to note, that in 2016 municipal elections Beirut Madinati civil society list got around 20,000 votes from this district. Such a number would have given such a unified civil society list in this election three seats. However, splitting their votes among three lists diluted their strength. *according to some reports around half of the country’s population live in the greater Beirut metropolitan area, and more than half of the GDP is produced there. 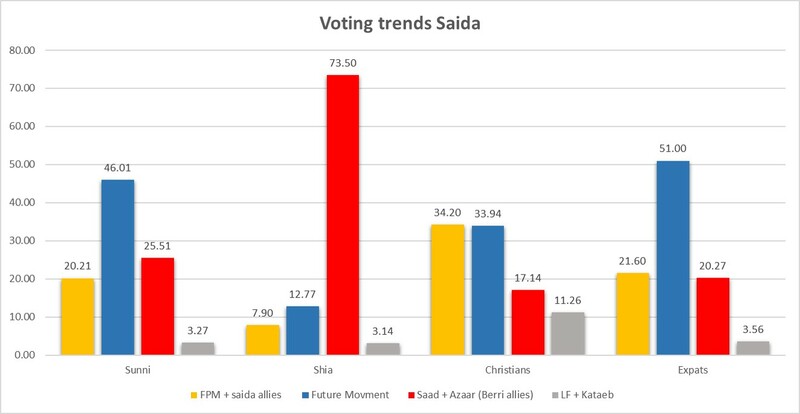 A detailed analysis of SAIDA's 2018 electoral result!